So there it is. 21 stages, 3,360.3km, 81 hours 56 minutes 33 seconds and a second yellow jersey. Chris Froome is on top of the cycling world. Thanks for joning us for the last three weeks. It's been emotional. There will be plenty of reaction on the BBC Sport website, so make sure you stay tuned throughout the night. The chancelllor George Osborne snuck his way on to the stage there somehow. Not sure where he came from. An emotional Chris Froome takes the microphone, his voice shaking slightly, he reads from a slip of paper. I want to start by thanking my team-mates, without you I would not be standing here. I give you my utmost respect and gratitude. This is your yellow jersey as much as it is mine. Thank you to the support team at Team Sky - your support has got me through the tough times. Thank you to my wife Michelle - your love and support are my motivation. The maillot jaune is special, very special. I will always respect it and never dishonour it and I will always be proud to have won it. Just as soon as Chris Froome is off the stage, he's back up the steps again and is having the yellow jersey put on his shoulders. The arms go in the air and that smile could stretch across the English Channel. A few British flags flutter in the gathered crowd. Chris Froome is on the podium, but not to pick up yellow. He's also won the king of the mountains classification. So he wears the spots - but he won't have them on for long, as he's about to get something slightly better. The Movistar riders are on the podium, accepting the award for the highest placed team. I don't spy him there, but Britain's Alex Dowsett, who dropped out midway through the Tour, is part of their number. I'm very happy because this year was very hard. My role in the team was different. I'm happy I've not crashed. I'm very satisfied. I had a lot of fun this year. Frenchman Roman Bardet takes the jersey for being the most combative rider. There's quite a few grumbles that Peter Sagan did not collect that award. Here's a man who deserves a ton of credit. Nairo Quintana, for the second time a runner-up to Chris Froome, is now a two-time youth jersey winner. What odds on the little Colombian being a future Tour champion? One minute 12 seconds is so close. Andre Greipel is up on the podium to receive the plaudits for that finish. He's closely followed by Peter Sagan, who takes the green jersey for a fourth consecutive Tour. No stage wins for the Slovakian though. No shortage of ambition there from Adam Yates after his Tour debut. But Adam, and his brother Simon, have been superb, and could regularly be spotted in breaks up the hills. Adam finished 50th overall. It wasn't as easy as I thought it would be - I had two flat tyres. But I got through. It's the first Tour finished with and hopefully I'll be back in the coming years and maybe do what Froome has done and win the yellow jersey. That's four stage wins for Andre Greipel on this Tour alone. It's indescribable. I don't really want to share this feeling -it's a bit selfish. It was stressful with the rain this morning - we saw how dangerous it was in the women's race. It was amazing to be able to celebrate in the last 500m. Geraint Thomas has been the star of the race. No-one expected him to be sitting fourth going into the Alps. He has emerged a grand tour contender. Tracey Gorham: So the alien abduction didn't happen, although they may be behind the bag. TDF#2 for Chris Froome. Quote Message: It's amazing. It's what I've always dreamed of. My team got me in the right position. I'd like to thank my parents and trainers. It's amazing. It's what I've always dreamed of. My team got me in the right position. I'd like to thank my parents and trainers. It was great to see Chris Froome cross the line there. Five years ago, if someone said Britain would have had one winner, we would have laughed. After Bradley Wiggins' win, I can't believe how much the sport has changed. Mark Cavendish was down in sixth in that sprint. We'll get the official standings shortly. It is about the team, that was quite special. It is not about individuals, Chris Froome could not have done that without the rest of them. Slowly, very slowly, behind them, come another bunch. Right at the back Team Sky link arms, a yellow jersey in the middle. Chris Froome smiles with delight and out of nowhere comes the sunshine. Chris Froome is officially a two-time Tour de France winner. Team Sky have had so much thrown at them literally and figuratively but they come out smiling. And it's Andre Greipel who wins the stage. They are all fighting and battling for position. They are clattering over the cobbles but there is a lot of damp. The green jersey is alongside Mark Cavendish. Four of the biggest sprinters are all together. Chris Froome is at the back and has to dart around a plonker in the middle of the road. Heads are flicking over shoulders, space is at a premium on the cobbles. The green jersey of Peter Sagan is there. So are Mark Cavendish and Andre Greipel. Lotto-Soudal have the most prominent position on the peloton, creating a sea of red. The battle begins. Kenneth Velbisen is a lone man up front. Rohan Denis is trying to join him. Sprinters are gathering towards the front of the peloton. That means we are on the final lap and the front three are getting pulled back. Three jets fly over the top spurting out the French tricolor. Lovely stuff. Froome is back in the pack with a bit of help from his team-mates. There is a paper bag caught in Chris Froome's back wheel. Alberto Lasada tries to be a kind soul and kick it out. Instead, Froome has to pull over and take a new bike. So the yellow jersey is having to scamper back on to the peloton. Another spin down the Champs-Elysees and the front three are 17 seconds ahead. The peloton is long and narrow and Chris Froome is right at the back of it. Quote Message: After 81 hours 56 mins and 33 seconds of racing, it has come down to one minute and 12 seconds. After all the talk about Team Sky it comes down to that. After 81 hours 56 mins and 33 seconds of racing, it has come down to one minute and 12 seconds. After all the talk about Team Sky it comes down to that. Nelson Oliveira, Florian Vachon and Kenneth Valbisen have now pulled 32 seconds in front of the peloton. Thomas Voeckler is at the top of the peloton, lapping up the adulation of his home French crowd. Alex Butler: Wiggo, Cav & Tommy Simpson. First two are obvious. Latter as he was the first British cycling icon. Hans Pinkard: Top three? Wiggo on the track, Wiggo on the road and in the classics, Wiggo in the Tour. Simples. Jack Degge: Anyone saying Wiggins above Froome didn’t actually watch the 2012 TdF. Froome gave the win to Wiggins by not attacking him. Nelson Oliveira, Florian Vachon and Kenneth Valbisen are still out front - they have a 20-second cushion over the peloton. I'm pretty sure it says Cav. Or perhaps Allez Cat... which would make no sense at all. This is probably the happiest I have ever seen a child to be on shoulders. Thibaut Pinot, yesterday's stage winner is back on his bike after suffering a puncture. He's getting plenty of support from the French crowd. Rob Hayles on BBC Radio 5 live sports extra is discussing Alberto Contador, who won the Giro this year but then struggled on this Tour. "Chris Froome doesn't try to win a lot of races throughout the year. Riders will pick their Grand Tours. To do the Giro and then try and recover for the Tour is very difficult." Chris Froome is still right at the back of the peloton, he may even have been hanging around the medical car. It's not a massive issue, but if everyone fell like dominoes, he'd be in a spot of bother. Chris Froome unveiled this bad boy earlier. Coincidentally I painted my Mondeo bright yellow last night in honour of the great man. My wife was delighted. Chavanel is caught and now Nelson Oliveira, Florian Vachon and Kenneth Vsnbilsen take up the lead. A quick loop around the Arch du Triomphe and it slingshots a few into action. Five are off the front tracking down Sylvain Chavanel. Chris Froome is right at the back - he's rubbish really. Sylvain is 12 seconds out in front. Behind him the teams will be working out how to get their sprinters in place - the likes of Mark Cavendish, Peter Sagan, Andre Greipel and John Degenkolb. Sylvain Chavanel of IAM Cycling shows the first spell of aggression of the day and has moved off the front. It gives the home support something to cheer. Former British cyclist Rob Hayles has been speaking on BBC Radio 5 live about Chris Froome having to defend himself against drug accusations. "I've seen people talk about his weight by going off a photo of his arm. If any of it was based in fact that would be one thing - it's based on hearsay and good results." One of my colleagues in the office is furious that some are stating that Chris Froome has won the Tour de France. Those people have obviously not considered the possibility of mid-race alien abduction. Actually, maybe the aliens could determine whether Froome is in fact human. Just finish the stage Chris. Don't do anything stupid now. Team Sky are still leading out the peloton. It's a lap of honour if you will. It should be 10 laps of central Paris - that could be reduced on a race organisers' whim. Plenty of cheering and clapping as the bright yellow jersey of Chris Froome comes through the Place du Concord, down on to the Champs-Elysees. Team Sky cross the line first, Geraint Thomas leading the way, and the clock stops, meaning Froome is Tour de France champion (assuming he does not fall down a hole or get sucked into another dimension). We're approaching the beginning of the laps. Team Sky are at the front of the peloton and as soon as they cross the line to start the laps, that will be the finishing time and Chris Froome will be Tour de France champion, as long as he gets over the line. You guys look like you're at Norwegian corner. I could be wrong - it wouldn't be the first time. Former cyclist Sean Kelly has just mooted that the 10 laps in Paris that lead to the sprint finish cut be could down because of the wet conditions and the late arrival of the peloton. No news yet though. Chris Froome has spent the last few minutes having a chinwag with Mark Cavendish. The TV cameras tried to pick up on what they were saying until they realised that Cav has an absolute potty mouth. This tweet confirms that Chris Froome only needs to get home today. So it would take something very horrific to take the yellow jersey away from him. Mark Wavish: Robert Millar- should have been the first British GT Winner; Chris Boardman-all of modern British cycling was built on his Gold of 1992. Chris Froome with 2xTDF & KOM must now have just eclipsed Wiggins, Simpson, and Hoy. We're nudging our way into the centre of Paris now. Slowly. Painfully slowly. We'll be at the Eiffel Tower in about 8km, so get your GoPros pointing upwards boys. You're in Paris. It's wet. You're waiting for a load of blokes to whizz past. Why not pass the time by sending us a photo? EuroSport spoke to yesterday's stage winner and defending champion Vincenzo Nibali before today's racing. Quote Message: A week ago it was a tricky Tour - I didn't feel I had much luck. But I've had to make compromises over what I wanted to achieve - the stage win was the best day for me. Even though it's raining today it's the last day and you go out to enjoy it. A week ago it was a tricky Tour - I didn't feel I had much luck. But I've had to make compromises over what I wanted to achieve - the stage win was the best day for me. Even though it's raining today it's the last day and you go out to enjoy it. Chris Froome receives a pat on the back from Simon Geschke and Simon Gechske's beard. Geschke's wonderfully manicured facial hair has been one of my highlights of the Tour. You can't beat a relaxing Sunday afternoon cycle can you? If you were strolling through the south-west suburbs of Paris at the moment, you might be forgiven for thinking the Tour de France was a family fun ride. The pace is snailesque. Small man peaky: Wiggins, Cav and Hoy. Wiggins in first and too close to call between the other two. Ollie: Froome, Cav and Hoy..... Why? Just look at the achievements! It's nice to see, after plenty of talk of abuse aimed at Chris Froome, that spectators are giving a warm reception to the yellow jersey wearer. Here's something you should definitely not do at home kids. Drinking champagne while cycling. Chris Froome is handed a (plastic) glass of bubbly from the window of the Team Sky support car. It doesn't look like he actually takes a sip though - probably for the best, just in case there is a French police car waiting to arrest him for drink cycling. Chris Froome catches up with the Team Sky boys after his clothing dilemma, and all of them ride alongside each other, draping arms over each other's shoulders. But Richie Porte is terrible at riding no-handed and almost knocks Froomey off his bike. This tweet suggests that as long as Chris Froome is part of the main bunch when the sprint starts, he will not lose any time. So he won't have to risk getting involved in a bun fight on the cobbles, which Geraint Thomas fittingly described as a 'proper bonkers' prospect. Alberto Contador, who will finish fifth on the Tour after winning a grueling Giro d'Italia earlier this year, has been speaking to EuroSport. Quote Message: My goal was a different one. My goal was victory, not just the podium and I haven't been able to do it. Some riders were stronger than me. Next year I may rethink my schedule. My goal was a different one. My goal was victory, not just the podium and I haven't been able to do it. Some riders were stronger than me. Next year I may rethink my schedule. Oh the weather is miserable. The peloton are taking no risks as they roll out on to the 109.5km route at a very steady speed. Chris Froome is wrestling with a jacket, which he expertly gets on. So. Just to be completely clear. Chris Froome is not expected to lose any time today, as tradition states the yellow jersey is not challenged going into Paris. The main racing action will take place between the sprinters, who will jockey for position right at the end of the stage on the Champs-Elysees. The riders who do not compete the sprint will be given the same time, as long as they are in contact with the main bunch behind the sprint. So Chris Froome's only concern today is if he were to fall off, get injured, and could not finish the race. And none of us want that. The official word from Le Tour is that no decision has been made yet. "Judges will consider the situation when the riders will approach the circuit in Paris," they say. Needles to say though, Chris Froome will be a happier man if he doesn't have the stress of avoiding a pile up on the Parisian cobbles. "The organisers are talking about neutralising the race when we reach the cobbles because of the heavy rain in Paris today, that’s what we’ve been told. It would be really good because riding on the Champs-Elysees in the wet is going to be proper bonkers. They’re pretty dicy at the best of times but in the middle of Paris, with all the oil on the road, it’s a bit of nightmare to be honest." So, you may be aware that it's a tad moist in Paris. It could prove problematic for when a huge peloton of riders embark on the French capital later today. In fact Hannah Barnes, who raced La Course earlier, admitted she was worried what might happen when the men come in. They're a little late starting in Ville-d'Avray, the riders are sat in the neutral zone. But soon enough we will be under way. Like a cyclist on the the downhill, I'm going to be using the next 30 minutes to rest up for the slog that's ahead. The final stage of the Tour gets under way at 15:35 BST - join us then when we'll have text commentary, your Paris pics and your top three British cyclists. I went down in the first crash. If you touched your brakes you were down, which I did twice. I'm hurt on both bum cheeks. I don't think I want to watch the men's race to be honest, it's pretty crazy. I've got an uncomfortable eight-hour flight tomorrow. "I can't believe it we had a good plan. We said we would attack in the last lap. I managed to keep it to the finish. We had more options and it was a hectic race. It's hard when you have the peloton chasing you. This is one of the biggest races I have won with so many people here. It was a hard and beautiful race. I'm disappointed for my team-mates. We did such a good race. In the end I just wasn't fast enough. I didn't have the jump, that happens but it will come back. I'm pretty jealous of that move from Anna, it was the perfect time to go and I wish I could've done the same thing. Our team was marked out of it, we would have been shut down. ITV4 have Marianne Vos working with them today. The Dutch legend was yelling her head off like a good un to cheer through her compatriot. She can shout as well as she can cycle. Britain's Lizzie Armitstead was right in the mix there at the end and was in the pack breathing down Van Der Breggen's neck. She comes in fourth. The 25-year-old is having a good year. That's the women's Giro, the Dutch time trial title and also the Flèche Wallonne in 2015. Not bad, that. Anna van der Breggen even had time for a small glance over her shoulder and the Dutch woman, who has been out in front for pretty much a whole lap, punches the air in delight. Her compatriot Amy Pieters was in pursuit, but it was too little too late. Seven seconds now. It looks enough. There's been another crash meanwhile. Now everything goes up a notch. Van Der Breggen will probably be caught. The lead is six seconds now. To be specific it is a 13-second gap. Acres of space in behind Anna van der Breggen. Can she hold on? Blimey - it's a huge gap she's got there. The peloton caught sleeping and they have just a few km to wake up. Uphill to the Arc de Triomphe now, through the puddles and the slippy tarmac. Rablo Liv pick up the pace with Anna van der Breggen attempting to go clear. There's the bell. Last lap ladies. It really is horribly soggy. But the pace goes up a notch and there's no break away yet. It's all set up for a very crowded sprint finish. Mark Turner: Difficult. Boardman, started the whole ball rolling. Wiggins, for success on track & road. Cavendish, greatest sprinter ever? Vanessa Winters: Robert Millar - unsung KoM, @rachelatherton - inspiring women's MTB, Brad Wiggins - first British #MaillotJaune. It's been a quiet race for Lizzie Armitstead so far, which is good news. The Brit crashed out last year and has managed to avoid trouble so far. She sits just off the front, where Belgium's Jolien D'Hoore looks well set too. Kirsten Wild is on her way back. Netherland's scratch world champion Kirsten Wild is trying to get herself back among the lead group, she's weaving between the support cars. The BBC's Sharon Fuller is with the British-based Matrix team today. "It's a race of attrition out there as Kim Le Court retires and is very pleased to be getting in the warm." Emma Johannson, the Swedish national champion and Olympic silver medallist, is seeing what the peloton is made of as stretches forward. There's a response as the rain picks up again. Steohen Betley: Beryl Burton, Barry Hoban, Tom Simpson. #bbccycling It's not all about the tour. These were trailblazers. It's been a while since I've been to Paris. Is there always a log flume there? Make that five crashes. This might be the worst yet. At least half a dozen riders go down from the thick of the peloton and a few more practically jump off the bike to avoid hitting the carnage. Lizzie Williams is at the front of the peloton again but can't create a gap of tarmac behind her. Lizzie Armitstead is in there too with compatriot Hannah Barnes hiding in the midst too. The peloton is back together and whizzes around Norwegian corner - it's a bit like Dutch corner but less drunk. Join Simon Brotherton, Rob Hayles and Caroline Barker for updates from Paris on BBC Radio 5 live and then live commentary from 16:30 on BBC Radio 5 live sports extra. Shelley Olds must have broken a mirror under a ladder while looking at a black cat this morning. A few moments after falling, her chain is hanging off. The American looks around for her Ale Cipoolini team for a new bike - they are nowhere to be seen. As soon as Elvin drops in, her Orica AIS team-mate Lizzie Williams takes up the impetus. Team Liv's Floortje Mackaij goes with her. Meanwhile, Gracie Elvin, who had been 20 seconds clear at one point, is about to get sucked back into the peloton. That's the fourth crash of the day by my count. USA's Shelley Olds, who is expected to challenge for her Ale Cipollini team, has clipped a wheel and gone down. She's straight back up though and moving again. We'll focus on La Course for now, but it would be remiss of me not to mention this guy early doors. It was thrilling stuff in the end, but Chris Froome will become Britain's first multiple Tour winner today. 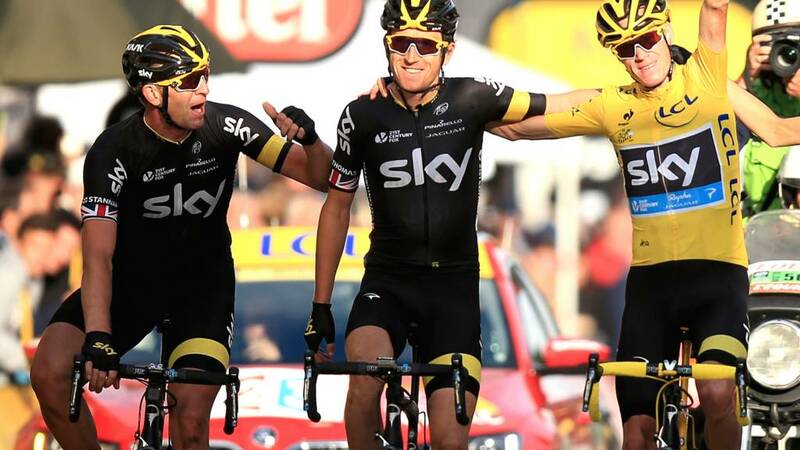 There is plenty of reaction on the BBC Sport website, but why not start here and read about how the Team Sky rider feared the yellow jersey was slipping away on that arduous climb up Alpe d'Huez. The peloton comes past the Arc de Triomphe with Orica-AIS rider Gracie Elvin mounting a break. She's pulled away somewhat. The Australian could well be launching a platform for her Swedish team-mate Emma Johansson later in the race. Lizzie Armitstead is safely placed at the front of the peloton, which is definitely the place to be at the moment. She has Australia's Tiffany Cromwell alongside her. Another crash. It shows you how treacherous it is on these Parisian roads. USA rider Maura Kinsella's wheel just comes out from under her on the wet surface and she takes one other don with her. With Chris Froome's latest achievement in mind, BBC Sport's Matt Slater has given a countdown of his own top 10 British cyclists of all time. It's all opinion of course, and we're sure you'll have your own ideas. So why not tell us your top three British cyclists? Use #bbccycling and explain your thinking. If you bagsied your place early in Paris today, you will have earned yourself double the fun. These Welsh fans are there to see Geraint Thomas come through with the Tour later - but in the mean time they're being treated to a chaotic women's race. The bunches are all over the place, although we're starting to get a bit more order, with stragglers filing on to the back of what I guess could be called a peloton. Most riders are back on their bikes after that crash, but it has held quite a few up. Britain's Lucy Garner was caught up in it and is trying to get back up to the pack - her team Liv-Plantur will be trying to slow down the pace. Last year's runner-up Kirsten Wild was also affected. You're probably aware that there has been a bit of commotion in Paris this morning. At around 08:00 local time a car tried to crash through a security barrier in the Place de la Concorde. Police opened fire and car sped off. There is no suggestion of terrorism as a motive. In fact, our BBC Paris correspondent Hugh Schofield suggests it might have been a reveler on the way home after a night out. It should't impact racing. Read the latest here. The BBC's Sharon Fuller is at the race with the British-based Matrix team, and she has a good view of the crowds, as well as the cyclist's nemesis - the cobbles. To make matters worse, it's raining pretty heavily, which might have caused the crash. The Parisian streets look as slippy as soap. Here was Lizzie beforehand. She will be looking for better luck this year, after being knocked off her bike in 2014. And there's been drama already. A few minutes ago this happened at the back of the bunch. We'll try and get a few more details. Good afternoon and welcome to our coverage of events in and around Paris today. There is action already afoot as the second running of La Course by Le Tour is under way. It's 89km of 13 intense laps around the centre of Paris with a finish on the Champs-Elysees.